3 Sided Table Stands for restaurants are constructed with leatherette material that is turn in and under on all sides for a neat contemporary look. Diagonal corners on this triangular table top display hold inserts in place. 3 Sided Table Top Displays hold 3 insert sheets and have a magnetic edge that allows table stand to lay flat for easy storage. 3 Sided Table Top Display is heat sealed with clear frosted vinyl panels to protect insert sheets. These heat sealed 3 sided restaurant table stands hold 3 inserts and are top loading. Constructed with a magnetic edge allowing the table stand to lay flat for easy storage. 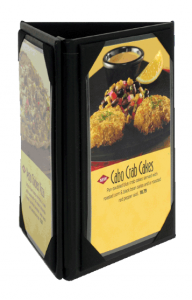 Heat sealed triangular table top displays are an economical choice, available in black only with clear vinyl panels. Triangular table stands for restaurants are great for promoting Wines, Drinks or Specials on your dining room tables, bar, counter tops and all other high visibility areas of your restaurant or hotel.